Removing mold from your home is essential to maintaining a healthy living environment. When mold spores grow, you may experience a wide variety of health issues ranging from minor inconveniences to severe reactions. The Institute of Medicine found that exposure to mold is linked to coughing, eye irritation, skin irritation, a stuffy nose, and throat irritation. It’s unhealthy to live with high levels of the mold for any period of time. Unfortunately, the mold removal products can cause equal amounts of discomfort for homeowners who are sensitive to the chemicals. What if you could still use these strong cleaners but without the lingering aroma of bleach and chlorine? Many of the leading mold removal products on today’s market contain high levels of bleach. This common household chemical is highly effective at killing mold spores and stopping new growth in its tracks. The downside is that the extremely pungent odor can make breathing more difficult for some individuals. Depending on the air flow of your home, this odor can linger for days at a time. The RMR Botanical Cleaner is bridging the gap between these harsh products and effective mold removal. According to most RMR Botanical reviews, this gentler solution can actually help to eliminate the odor of stronger chemicals. It features a plant-based formula that is designed to eliminate odor-causing bacteria right at the source. This is a great option for homeowners who don’t want to mess with mixing up their own concoction. Each bottle is already mixed and ready to spray on any affected areas to get rid of long-lasting odors. It should be noted that the RMR Botanical product does not actually kill mold growth. It does clean the surface, but it is meant to be used in tandem with a secondary product aimed at killing the mold spores. This sister product is known as the RMR 86 Rapid Mold Stain Remover. You will first need to find the source of the mold growth and remedy the moisture problem. However, this product is essential to making your home or work environment breathable once more. Instead of opting for stronger chemicals, you will want to try this cleaner instead. This botanical blend is ideal for penetrating deep into porous surfaces found around the home. You’ll find it to be a simple and effective solution to your odor-causing mold and situations around the home. What is RMR Botanical Made Of? Most homeowners are right to be concerned about the ingredients in their household cleaners. Fortunately, RMR Botanical contains a number of natural ingredients that are safer than some other extremely harsh cleaners. According to their safety data sheet (SDS), the two primary RMR Botanical ingredients are thyme oil and lemongrass oil. You should still use caution when applying this cleaner, but it is ammonia- and chlorine-free. This does lend the product a much more pleasant aroma, according to reviews. The cleaner is actually designed to help air out mold removal products with a high bleach content. These ingredients are relatively stable and lead to a long shelf life. You can store this fungicide for up to three years without reducing its efficacy. There’s no need to worry about this cleaner and treatment while it’s sitting on the shelf either. It is not flammable, combustible, or corrosive. In other words, you have nothing to lose when it comes to purchasing a bottle of the RMR Botanical. It’s a great cleaner to have on hand for when pesky odors linger. What Can You Use RMR Botanical On? Unlike other cleaners that require scrubbing and rinsing following the initial application, all you will need to do is spray it on the surface. No additional cleaning, wiping, or rinsing is necessary because of its natural ingredients. That’s another one of the great benefits of having a plant-based cleaner instead of a harsher alternative. Purchasing this cleaner saves you lots of time and elbow grease in addition to being better for your health. 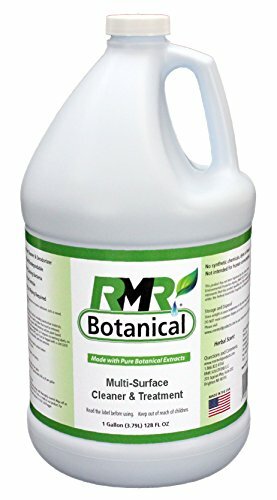 Will RMR Botanical Remove Mold Stains? As most RMR Botanical reviews are likely to mention, this product is designed specifically to clean the area and remove any odors. Homeowners who have taken care of the root cause of their moisture issue can benefit from using RMR Botanical to neutralize the odor. Unfortunately, it won’t remove the stain or kill the mold though. Instead, you will want to purchase the RMR 86 Rapid Mold Stain Remover to remove the stain and kill the mold. This is a sister product to the RMR Botanical, and both steps are highly recommended. The RMR 86 can help to kill any sources of mold and restore the affected area. Using this cleaner is an essential step that you should take prior to doing anything else. You will need to take extra precautions prior to using the RMR 86 Rapid Mold Stain Remover. One of the primary ingredients is bleach which can cause damage to the skin and lungs. Because it has such a high percentage of bleach, the odor of the stain remover can be problematic. It’s recommended to utilize the RMR Botanical spray if the odor persists for longer than one day. These two products are designed for use in combination with one another, so be sure to purchase a bottle of each. If you’ve been searching for a natural way to rid your home of the mold without the odor associated with other products, RMR Botanical Cleaner could be the perfect solution. At a reasonable price, this product is considered to be highly effective in most of the RMR Botanical reviews. You can experience all of the benefits that this cleaner and treatment has to offer your home with just a few quick sprays.